Imagine the simplicity of WordPress, the complex features of SharePoint, Vignette and Collage coupled with compatability across all major operating systems and browsers with no additional software to load. We already have and it's called infaCORE™. infaCORE™ is a web based Content Management System (CMS) and Customer Relationship Manager (CRM) combo in a single, cross-platform, web based system that allows your entire team to work on site content independently no matter what their favorite browser is. We've combined the best of the best into a single CMS, CRM and Bulk Email system combination that employs Search Engine Optimization techniques and Search Engine Friendly URL's in a secure web application. The multiple file uploader tools built into infaCORE™ make it easy to "select, click and forget", allowing faster management of your documents, images, audio and video files in a secure, feature filled document repository. 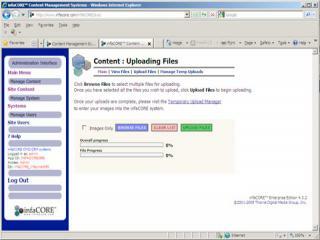 Browse for multiple file(s) with only a single click without downloading and installing any additional software*. Push large batches of files to your server and manage them fast and easy with real time status updates on overall batch and current file uploads. *Multiple file uploads require Adobe Flash - non flash solution auto detects your browser's settings. Easy for advanced and non-technical staff alike. Create bulk email templates, Schedule bulk mailings to your site subscriber and member lists or create Press Releases with view/open/click tracking. Our fanatically devoted technical team is on duty 24 hours a day, 7 days a week. Call Toll Free (888) 341-3707 for fast deployment of your site within hours instead of days. © 2019 infaCORE CMS/CRM systems, All Rights Reserved.